Network Function Virtualization is one of the hottest topics nowadays in the IT industry, based on different researches it’s said that it is expected that by the next couple of years the industry of SDN/NFV will become worth Billions. Seeing the trend, Cisco comes with the Cloud Service Platform 2100 to fulfill the market needs in the NFV world, with a highly innovative platform where customers are able to spin up new network services in couple of minutes rather than hours or days as it used to be in the past. CSP-2100 package comes in 2 flavors, as a hardware (based on UCS server’s) or as a software platform (customer owns an x86 hardware). Check here for more regarding the Product. Overview; Here we can see information’s regarding the Status and Resources available by the host (or cluster) where CSP-2100 is running on (such as, HostName, IPaddress, CPU, RAM, Disk Space, and Crypto). Services View; All available and running network services will be listed under this tab, their interface traffic rate and the host or cluster where the network service is deployed to. Network View; This tab is simply giving us the opportunity to see all the physical network interfaces that are available on this machine as well as the traffic/bandwidth statistics. Services; This is the main place where we create new network services, in addition to that we can see Network Services details, such as the Service Name, Status, running Image, Power/State, Console access, and Actions button that allows you to Turn On/Off the service, reset, delete or edit the deployed Service. pNICs; Physical network interface cards are shown under this option, their state, speed, vlan membership, and port-channeling. Cluster; The CSP-2100 gives us the opportunity to run the platform on more than 1 physical machine but acting as 1 virtual platform by Clustering the physical resources. Repository; That’s the place where we have to upload the Images upfront and run the VNF services (e.g CSR1000v, ASAv, 3rd party images, etc) by creating them as explained above. NFS; Network File System is also supported by CSP-2100, giving you the possibility to run the storage based on remote resources. – Administration; The third and last option where the admin login credentials can be changed. Overall the CSP-2100 was designed to run on Kernel Virtual Machine (KVM), meaning you don’t have to pay for Hypervisor licenses however, you can still run it on VMware based Hypervisor and any other. As such it can be placed on different part of the networks, starting from DMZ, WAN edge, in the core or the server farm. There’s many customers using the CSP-2100 on their production network, and many more are eager to test before deploying in a lab/non-production environment. 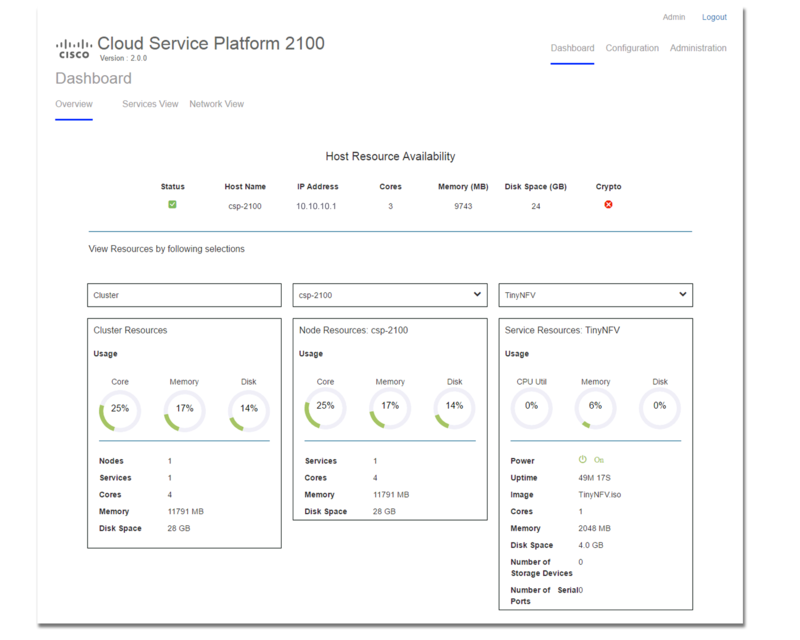 Now CSP-2100 is also available on Cisco dCloud, give it a try yourself and see the benefits of the platform.